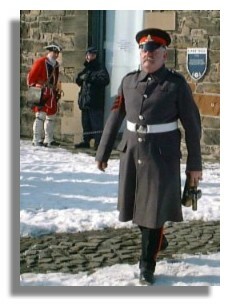 The firing of a gun from the battlements of Edinburgh Castle at 1pm from Monday to Saturday was not introduced as a tourist attraction (though it has become one) or to alarm pedestrians in Princes Street below (which it does, even regular shoppers). It started as a means of giving an accurate time check to the ships in Leith Harbour - two miles away. In the days before accurate clocks and when navigation was done by sextant and knowing when mid-day had been reached, resetting ships' clocks had to be done once the ship was back in port. A Scot, Captain Wauchope of the Royal Navy invented a time ball which fell from a tower to let ships know an accurate time. 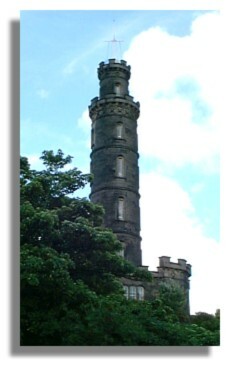 Such a device was set up in 1861 on Calton Hill in Edinburgh, visible in the harbour and in the city. It was set up on the Nelson Tower, connected to an accurate electric clock in the Astronomical Observatory near the tower. But on foggy days, the ball could not be seen - and anyway people had to be looking at the tower round about the right time. So Charles Piazza Smyth, who was Astronomer Royal for Scotland at the time introduced a complex system involving the firing of a gun from Edinburgh Castle. It involved a signal being sent along a 4,000-foot steel cable to the gun at Edinburgh Castle (laid by sailors from Leith in just two days) . In June 1861 a gathering of Edinburgh's senior citizens gathered to watch the inauguration. The only problem was, the gun failed to fire! It took three attempts before the cannon worked properly. The signal on Edinburgh's Castle was not the first (others had operated at an earlier date in Glasgow, Greenock, Newcastle) but it is the only one to have survived to the present day. In addition to firing at 1300 hours, the gun is these days called upon to fire at midnight on New Year's Eve and appears on television in that role. Initially, the gun used was a 18-pound muzzle loading cannon which needed four men to set it up and fire it. 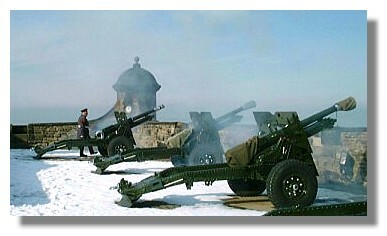 In 1953 the present 25-pounder howitzer was introduced. This was a gun which was the mainstay of the British artillery in the second world war. 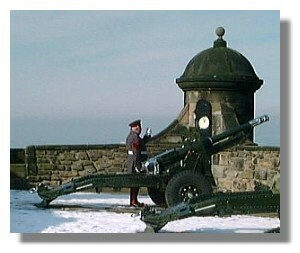 The gun used to be fired from the "Half Moon" battery on the castle to its present position on the Mills Mount Battery. There are four guns there and a salute of 21 guns can be fired on ceremonial occasions (there are at least Royal Salutes each year). Ammunition (blanks, of course) for the WW2 25-pounder is running short and a modern 105mm light gun is to be used from September 2001. An exhibition, telling the story of the One O'Clock Gun and full of facts and figures (including how far away the gun can be heard -which varies depending on wind direction) was set up a few years ago beside the gun at the Mills Mount Battery. Almost as big an attraction as the gun itself, District Gunner, Staff Sergeant Tom Mackay, MBE, is the longest serving District Gunner of all time. Known affectionately as "Tam the Gun" he has been firing the gun since 1978. He has become identified with the gun (and has written a book about his experiences) and has been invited to many events - with and without his gun. He is reckoned to be one of the most photographed people in Scotland as thousands of photos of him firing the gun are taken by tourists every year. He makes a theatrical experience out of the firing of the gun, with his military bearing and stop-watch held high in the minute before the gun is fired with a flourish - and that loud bang!